You are currently browsing the tag archive for the ‘Black House Comics’ tag. I’m reviewing the After the World series out of order, I’m afraid. I started with Jason Fischer’s Gravesend because I wanted my work experience student to read it (I made a fifteen year old read a zombie apocalypse story – my soul is probably doomed to strange perdition). I read Killable Hours first, however. Killable Hours reminded me that zombie books are changing. Gravesend made me think about John Wyndham, with its set-up of a cosy apocalypse. Killable Hours does this even more than Gravesend, because it’s close to home and kills off all sorts of people we’ve wondered about. 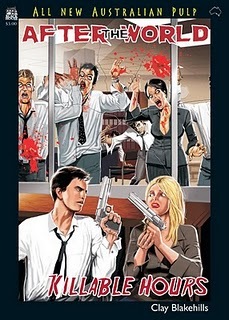 Just the thought of zombie lawyers makes several of my friends smile, as if this was destined. I still don’t quite get why it’s funny to ponder upon zombie lawyers and not upon zombie bricklayers, but it is, and Blakehills has taken advantage of this absurdity. 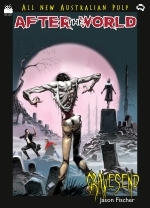 It’s a serious zombie novella, but, like Gravesend, there’s a sense that it might be just a little tongue in cheek. This makes the whole thing (like Gravesend) just a cut above where it would otherwise be. The macabre humour underlying the spatter and gore means that it never takes itself quite as seriously as the surface suggests. In other words, it’s fun. 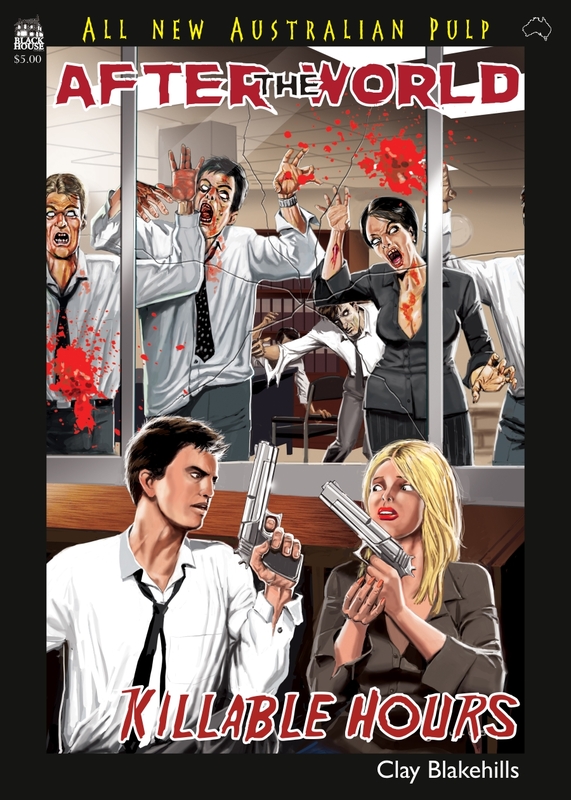 Killable Hours is the first volume in Black House Comics’ After the World series of stories set in a zombified Australia. Promoting itself as “All New Australian Pulp”, the After the World series draws on the American pulp magazines (1890s-1950s) and their predecessors the Penny Dreadfuls and Penny Bloods of the 1850s and 1860s which gave spawn to a many mythic characters such as Sweeney Todd: the Demon Barber of Fleet Street and Spring Heel’d Jack. These magazines contained stories peppered with violence, murder, crime, and supernatural visions meant to shock and disgust. They were cheap and expendable, much like the hordes of lawyers in Killable Hours. As a law intern completing the final year of his degree, Terry has decided that law just isn’t his bag, baby. Luckily for him he won’t have to complete it because, as is happening a lot lately, the zombie apocalypse occurs without any explanation as to how it happened and why. Apocalypses just happen these days and, well, there you go… On the other hand, Terry is somewhat unlucky as a bunch of lawyers in the firm soon go from “bloodsuckers” to flesheaters after more than just his pound of flesh. Terry manages to survive the first onslaught and with fellow survivors Janelle and Neville, eventually have to fight their way out of the firm’s inner city high-rise building.